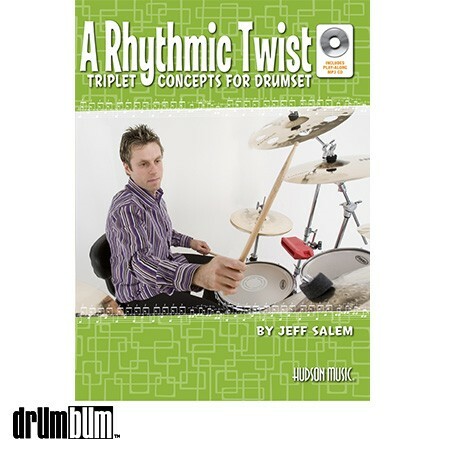 A Rhythmic Twist Book/CD – Triplet Concepts for Drumset – Can you learn how to swing? Yes, and this book will show you how, giving you a huge vocabulary of creative triplet grooves and fills to play in every style. The book does this by taking common, comfortable 16th-note patterns and adapting them into a triplet feel. The results are amazingly musical and refreshingly creative, and will give any drummer tons of ideas to play within any swing-based groove. Jeff Salem covers many concepts, including solidifying your basic triplet grooves in various styles, moving around the drumset with triplets, incorporating the bass drum into your fills, creating interesting triplet grooves using 16th note-based rhythms, applying paradiddle concepts to triplet grooves and fills, incorporating rests into your swung phrases, and more. In the later chapters, the triplet rhythms presented are applied to fills that can be used in blues, R&B, rock and hip-hop settings, and are also applied specifically to jazz concepts to broaden your independence and vocabulary in a traditional swing setting. An introductory section with basic triplet feels and a listening guide is designed to start beginning-level drummers on the right path to understanding swing-based styles. The book comes complete with an MP3 CD presenting play-along tracks in many styles, which are designed for you to apply the concepts learned in the book. The disc also includes demonstrations of nearly every example in the book. Softcover Book approx. 9″ x 12″ and 76 pages. Rhythm Books and more at DRUM BUM!